Georgia Russell has become known internationally for the works that result from her techniques of cutting and transforming books, printed ephemera and photographs. This fifth solo exhibition at England & Co features new cut paper constructions that primarily explore notions of orientation relating to landscape. Other iconic works incorporate dissected books presented in bell jars or as totemic structures that echo the fetishist tribal objects collected in the 1920s by Surrealists such as André Breton. Russell’s works have always hovered between object and image, and in these new works, her main focus is on modifying the surface of her materials and extending them by a process that she describes as ‘cutting through time’. Russell takes an existing image or object and changes and transforms it by excising and removing some of its original qualities. 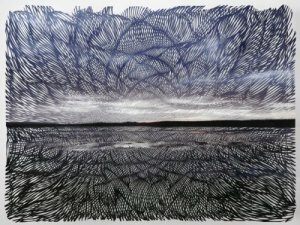 She ‘goes behind’ an original flat, two-dimensional image, whether it be a printed page, a book cover or a photograph, using her scalpel to create a sense of flowing movement with rhythmic, repetitive cutting. Russell recently came across the word ‘inscape’ as used by the neurologist and author Oliver Sacks when he wrote about the ways that blind people imagine images of things: she felt that ‘it summed up a kind of landscape particular to oneself and the memory of an image, place or time’. ‘Inscape’ was also used as a way of describing the Chilean artist Roberto Matta’s Surrealist paintings from the late 1930s, and the word has been used by poets and other artists to denote both concepts of individual identity and interior landscapes of the mind. Russell feels that her landscape-based works function as ‘inscapes’, evoking memories of an image, place or time. These works are often multi-layered, giving an almost moiré effect with light and shade: she is very conscious that photographs exist in the past once they have been taken, and in attempting to bring them into the present moment, she chooses to work with new archival prints made from recent and vintage photographs of forests, mountains or water. The atmospheric, vestigial landscapes that remain after her cutting process appear like images caught in nets – her cut-out traceries with their accompanying shadows function as ‘membranes of memories’. From the beginning of her career, Russell has been interested in layering, repetition and pattern. She studied printmaking at the Royal College of Art in London, and her practice initially developed from her early explorations in making prints and subsequently working using cutting and collage with books and already printed ephemera. She likes to draw, and the scalpel has come to replace pen or pencil as she uses it to draw ‘in negative’. The atmosphere of the original material she uses is extremely important to her, and her use of either new, or of older papers or images redolent of past lives, is dependent on the mood or idea that she wants to communicate. Many of Russell’s objects using books hint at organic forms, reminding the viewer of feathers, birds, trees or even organs of the body. She enjoys this ambiguity as she wants the works to ‘be curious’. French critic Anne Malherbe has pointed out that Russell ‘delivers an object for us to gaze at – like a trophy… a testimony to relationship she has established with the work over her time labouring on it’. Russell has exhibited in Europe, Asia and the USA: exhibitions include Slash: Paper Under the Knife at the Museum of Art & Design, New York; the Holland Paper Biennial, Coda Museum, Holland; The Book Borrowers: Contemporary Artists Transforming the Book, Bellevue Arts Museum, Washington, USA; Imaginative Qualities of Actual Things, Price Tower Arts Center, Oklahoma, USA; Novel Ideas, Oakville Galleries, Ontario, Canada; Contained Thoughts, the Courtauld Institute Library Exhibition Space, London; Cut It Out: Contemporary Paper Cut Artists at the Otter Gallery, Chichester, touring to Southampton City Art Gallery. Russell’s work has been featured in many books, exhibition catalogues and magazines in recent years. Two of her works have been acquired from England & Co by the Victoria and Albert Museum, and her public art commissions include a sculptural installation at the Jubilee Library in Brighton, UK.